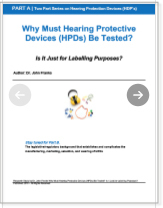 Why must Hearing Protective Devices (HDPs) be Tested? History behind testing Hearing Protection Devices. The HPD has been a work in progress for more than 125 years. The first earmuff was developed in 1873 by 15-year old Chester Greenwood, but not patented until 1887. HPDs are designed to reduce the amount of sound reaching the eardrum by obstructing the ear canal. Regardless of features, shapes, or configurations, the process is the same for all types of HPDs. They either cover the ear as with earmuffs, occlude the entrance to the ear canal as with canal caps, or they fill the ear canal as with earplugs. So then what is the good, the bad and the unknown about testing HPDs (Hearing Protective Devices) and what would m ake selecting the correct HPD difficult? HPDs are complex enough that a change of one element changes the entire device. Any change in an HPD design, including the insertion of a vent or filter, must be treated as a new system and therefore subject to new testing. Learn more about Why Must Hearing Protective Devices (HPDs) Be Tested? Download a Hearing Protective Devices Research Study conducted by John Franks Ph.D. Subscribe to Download. Please Note: Subscribers will be asked to verify your email address. Once the email has been verified and the Subscriber has “opted in”, the subscriber will receive a link to the Case Study.